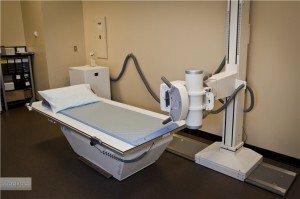 Our X-Ray Technicians are certified and trained in radiography. Unlike traditional radiography, which uses photographic film to capture	images of the human body, digital radiography, more commonly referred	to as X-ray, stores its images in computer files, just like a digital	camera does. The primary advantage of digita X-rays is time. Since the images don’t	need to undergo the chemical development process that is required by traditional	film-based radiography, digital X-Rays are available much quicker. Digitally stored X-Ray images can be viewed on any number of devices, including	desktop and laptop computers and hand-held devices such as tablets and	smartphones. This can facilitate the sharing of information between doctors,	which can result in better patient outcomes and reduced costs. In some cases, digital radiography requires less radiation to achieve an	image of similar contrast and clarity than that of traditional film-based	radiography. At MK Orthopaedics, we invest in state-of-the-art technology such as this	because we feel it not only allows our specialists to do their jobs better,	but that it also ultimately has a positive impact on our patients’	experience.